Let your creativity reign. Protect your door's most vulnerable area while utilizing color and artistic flare to create a matching color kick plate. Available in 60 Colors and .040" or .060" thick. 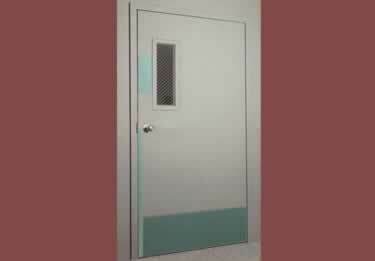 Ideal for protecting your doors from wear and tear associated with heavy foot traffic. I am in a wheelchair have an adapted kitchen where the countertop where the sink is moves up and down. That countertop is backed by s a wood counter. Water from the sink splashes the wood, which I want to protect. I need an 8-10" high and 43" long protector for the wood. What do you suggest? Good evening, Can I order the door kick plate in clear? With no color? Thank you. Can these be used to protect doors from dogs who scratch at it to get in/out? One side of the door is metal and one is wood. Should I use metal on the metal side, or is the vinyl OK on both? I would like to order two black vinyl kick plates. 1 @ 4"x18" and 1@ 4"x23". Can you please provide a price? Is it possible to get a sample sent to us? Can you order the vinyl kick plates to the exact size you need or do you order from the sizes provides and cut to fit? Can we order this product oversized and trim them to fit? and how are they applied to the door? We needed some drywall protection which was a riser for steps that went from our kitchen to den. The vinyl door kickplate material was perfect for this. I used a good quality doubled-backed tape to mount it to the wall. I had this product installed onto our fire doors and some apartment doors. The doors are 40 year old solid wood doors and they were pretty beat up from all the constant scrapes from wheelchairs, walkers etc. Perfect and they look great!!! This product was installed on the entry door to our Maui, Hawaii condo. We are here for 2 months during the winter. The other 10 months of the year we have our unit in a vacation rental program. We are hopeful this kick plate will protect our new entry door from being damaged by luggage carts. Love the choice of colors and sizes. The product was easy to install and looks very nice. We'll let you know next year how it held up. The only suggestion I have is sending a confirmation email that the product has been shipped and what the tracking number is. Easy purchase - fast delivery - Thanks!! Easy to purchase; fast delivery, and good products! Permanently shield your door edge to protect it from unsightly marring and excessive wear.